Pet Dominion is the most award-winning and veterinarian-recommended pet care facility in the Rockville, MD area offering premium dog boarding services. 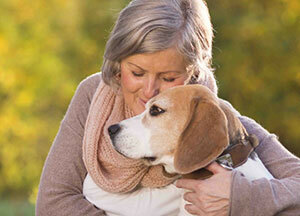 As pet parents ourselves, we know that choosing a trustworthy pet care provider or facility is an important decision. We appreciate price is certainly one consideration. Our Standard/Basic Overnight Lodging starts as low as $31.95 per night. 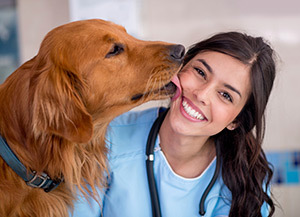 Call us today to understand what is uniquely included in our amazing standard, comfy, secure care and why leading veterinarians recommend our award-winning facility in Rockville, MD above other providers. Please see our vaccination policy below. Call us at (301) 258-0333 to make a reservation request. We have a reliable staff to ensure all of our guests are well cared for. Let’s face it, from time to time, an individual you entrust to take care of your pet may get sick, have a family situation arise, or have transportation issues due to serious weather. Because we are a full-time pet care business, we make special accommodations to ensure we always have trained staff to care for our guests. You’ll have peace of mind knowing that your pet is well cared for in an impeccably clean, caring and secure home-away-from-home. Unlike a home environment, our facility was built with pets in mind. We continuously invest in the proper training, equipment and protocols to keep our facility super clean and your pet safe while in our care. This includes secure fencing, fire prevention, proper ventilation, training to understand and reading pet’s body language, basic pet first aid, vaccine requirements, etc. Our staff has been trained in the most updated and important pet care training. Wellness checks are performed throughout the day and pets are monitored by our full team of trained, pet care professionals. Having a veterinary team on site gives you extra peace of mind knowing that your pet will be well cared for. Rather than including a one-size fits all approach to activities, we realize each pet parent knows their pet best, so you can choose the right amount and type of activity for your pet. Our dog boarding facility also gives dogs the opportunity to socialize and play with other dogs— SAFELY! Call us today to customize your pet’s activity options and learn about our discounted activity packages. 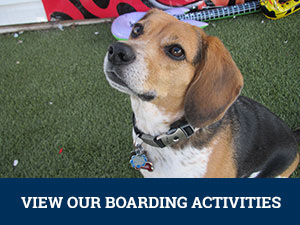 Read more about our Dog Boarding Activities. We are committed and follow all the local and state requirements. Outside agencies are designed to regulate good, quality care. These standards are designed to give you extra peace of mind that your pet is being cared for by professionals in a secure environment. This is not our hobby but our career and passion. We are committed to sustaining a viable community business to provide high quality pet care. As the leading pet care provider in our area, Pet Dominion often has limited availability, especially during busy travel and holiday seasons. We encourage you to speak with one of our reservation specialists as soon as possible. With canine influenza cases on the rise in parts of our country, we have decided to take the proactive step to begin requiring all dogs who stay with us (both overnight and for daycare) to be vaccinated against both strains of this highly contagious disease. 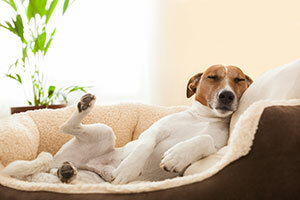 This respiratory illness is spread directly via dog-to-dog contact as well as through contaminated surfaces such as bowls, toys, leashes, hands, shoes, and clothing. All dogs are susceptible, but social dogs are most at risk. We are committed to ensuring the health and safety of all of our guests, which is why we are requiring the bivalent vaccine for all dogs staying in our lodging and daycare resort. With confirmed cases in Florida, Georgia, and North Carolina, we feel that vaccinating against both strains is the best way protect your pet. As always, we will continue to monitor this situation. The health and safety of your pet is our top priority, and we are committed to staying CIV-free. If you would like more information on the bivalent vaccine and/or to schedule your dog’s appointment, give us a call. All rates are subject to change based on season and availability.